Way out in the remote Pacific on a tiny slash of land stands an astonishing array of monumental, multi-ton statues gazing out over a barren landscape. Why are they there and who were the people who were sufficiently sophisticated to have created them? What do the monoliths tell us, and how did they get from the inland quarry where they were carved to the coastal perches where they loom over the vacant horizon? Was the sparsely populated land the Europeans first encountered in 1722 a textbook case of eco-suicide, the self-inflicted collapse of a culture brought on by the unsustainable magnitude of its demands on the environment? . Hunt and Lipo began their archaeological studies on the island in 2001. 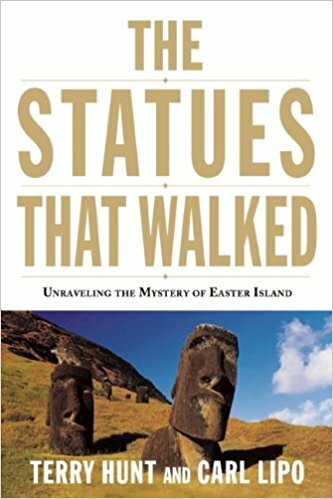 The Statues That Walked discusses the archaeological discoveries they made and incorporates the findings of others to reach compelling new conclusions about the history of the island and its inhabitants and the world-famous figures. Moreover, we learn how the Easter Islanders met the environmental challenges they faced, increased their agricultural productivity, and managed to achieve a sustainable environmental balance of. Are there lessons for the contemporary world to glean? Our first meeting of the fall season, on September 14, was extremely pleasurable as well as instructive. The book generated a great deal of discussion, and we shared some maps and copies of photographs from Smithsonian Magazine and other print media. The rebuilding of the libraries and mosques in Timbuktu is still continuing apace– apparently the reconstruction program is a somewhat of a priority with UNESCO and numerous European foundations. Alas, kidnappings by radical Islamic groups in northern Mali still take place, too, with deaths incurred. So this story is ongoing. The book for November 16 will be The Mummy Congress: Science, Obsession, and the Everlasting Dead by Heather Pringle. Those who finish reading The Statues That Walked early may want to get started on The Mummy Congress in order to free the book up for others subsequently. There are only 8 copies of The Mummy Congress in the Westchester Public Library. If all copies are in circulation in November and you email me, I can get additional copies elsewhere.